This week I didn’t write my own review, but will instead be sharing excerpts from a review of some brass trio arrangements I published through Cimarron Music Press. 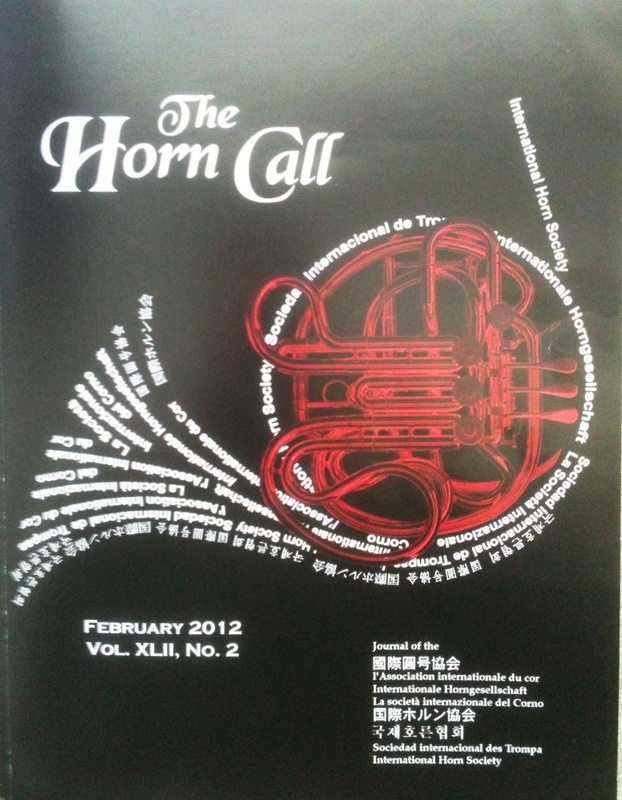 This very kind review by Jeffrey Snedeker appears in the February 2012 issue of The Horn Call (cover image at left), and looks at the following arrangements of works by Arcangelo Corelli and W.A. Mozart. Snedeker opens his review by summarizing the current state of affairs in brass trio music. He goes on to offer a very historically informed review of the arrangements, and also makes an excellent suggestion for improving one of the pieces. Snedeker is right on the money with his suggestion, and I don’t really know why the movement titles were left off in publication. I must have missed it when I went over the proof, but I plan to pass this information along to Cimarron. The remainder of the review is in general very positive – for the full article you’ll have to pick up a copy of the most recent Horn Call. I know that Professor Snedeker must receive many more submissions than he could possibly review for each issue, and I appreciate his taking the time to consider my materials so thoroughly. Here are his closing thoughts on these arrangements. If you are a member of a small brass ensemble and are looking for some new repertoire, I encourage you to check out these arrangements. I think they work quite well, and can provide some breadth and variety to your next performance. For a sample of one of these arrangements, here’s the closing section from the last movement of Mozart’s Divertimento I, K. 439b. This recording actually predates the publication of these arrangements, and the performers are Marilynn Gibson, trumpet, James Boldin, horn, and Micah Everett, trombone. The recording is from a live performance on February 4, 2010. This section is notable for the mid and low range workout for the horn player.